Our story first began in 1961 when Albert Yost Sr. retired from the Coast Guard Band after playing the tenor saxophone for 20 years (click here to listen to him play). Albert, originally from Pittsburgh, and his wife Catherine, from Brooklyn, decided to stay in the area and grow roots for themselves and their five children. With Albert’s knack for home repairs, opening a home improvement company was a natural choice. The Yosts quickly turned their home into company headquarters. During the early days, Albert oversaw projects while Catherine fielded calls and stayed on top of paperwork. It also wasn’t unusual for Catherine to prepare full course meals for the crew. 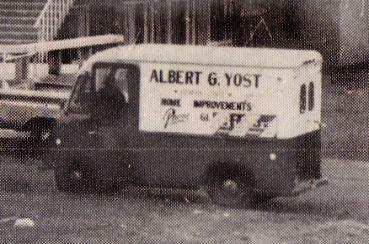 Soon the Yost’s two sons Albert Jr. and George joined the company, eventually taking it over in 1983. Throughout the years, the Yost brand has expanded greatly. After finding the gutter products they were receiving from suppliers did not meet their standards of quality, Yost decided to become their own supplier. 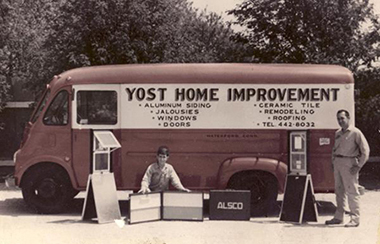 In 1981, they purchased machinery and established a second company, Yost Manufacturing and Supply. Today, every gutter, downspout and elbow Yost Home Improvements installs on a home is created by Yost Manufacturing and meets the highest level of craftsmanship. Yost has been an innovator in the gutter industry, with George designing and patenting a system to eliminate visible metal straps when gutters are attached to roofs. Since its inception, Yost Manufacturing has grown to distribute gutter machines and materials worldwide to customers in places as far reaching as Brazil, China and Australia. 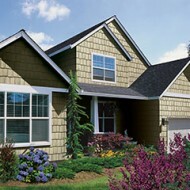 The Yost headquarters have also gone through several facelifts over the past five decades. In 1989, they purchased their current location on Hartford Turnpike in Waterford, the former site of the well known Ralph Strong Motorcycles. In 2002, with two businesses now operating under one roof and both requiring additional space, Yost transformed their building with a renovation that tripled its size. Albert Sr. passed away in 1987, but Catherine has continued to be involved with the business, impressively manufacturing elbows well into her late 70s. Although now retired, she still frequently visits the office and helps out where she can. Yost also continues to be a family affair. While Albert Jr. and George run the businesses, George’s wife Kathe oversees human resources as she’s done since 1976. Albert Jr.’s son and daughter and George’s three daughters have also all played integral roles in the company over the years.